Suitable for portraits, snapshots, landscapes and just about any other type of photograph, the Standard Picture Control gives you standard, balanced images. With Standard, you can adjust sharpening, contrast, brightness, saturation, and hue (coloration) individually. Quick Adjust enables easy, balanced adjustment. Delivers images that are closest to the original scene. To reproduce the subject’s unique colors and gradations with maximum authenticity, avoid extreme enhancements. Compared to Standard, Neutral gives a more soothing overall impression. With Neutral, you can adjust sharpening, contrast, brightness, saturation, and hue (coloration) individually. For distinct, colorful, fresh-looking images with just the right emphasis on your subject’s contrast and sharpening. Compared with Standard, Vivid bestows a more glamorous overall impression. It’s ideal for situations where you wish to emphasize primary colors, such as colorful fashions, city streets, fresh fruits and floral arrangements. With Vivid, you can adjust sharpening, contrast, brightness, saturation, and hue (coloration) individually. Quick Adjust enables easy, balanced adjustments. Gives you monochromatic shadings, such as black-and-white or sepia. You can also select Filter Effects, to create the kind of results you get when shooting with a color filter for black-and-white photographs; and Toning, to adjust the overall tone of images in a way that formerly required working in a darkroom with photographic paper when shooting with film. With Monochrome, you can adjust sharpening, contrast, brightness, Filter Effect (Y/O/R/G), and Toning Saturation individually. Using Neutral as its base, Portrait imparts more natural appearing skin, so skin tones are more lifelike, projecting a real sense of depth—as if shot with professional-quality film—for a clear, authentic finish. With Portrait, you can adjust sharpening, contrast, brightness, saturation and hue (coloration) individually. Quick Adjust enables easy, balanced adjustment. Produces a more noticeable intensity than Standard. Compared with Vivid, Landscape creates more soothing, relaxed colors, effective for any nature scene; for images that have rich gradations and enhanced vibrancy. With Landscape, you can adjust sharpening, contrast, brightness, saturation and hue (coloration) individually. Quick Adjust enables easy, balanced adjustment. Flat provides minimal dramatization while preserving the material characteristics. Compared with Neutral, the finish shows less contrast and does not look as lively as it is. When you add adjustment to the video after shooting, overblown highlights, blocked up shadows, or excessive color saturations rarely occur, thus enabling rich tonality of both brightness and color tones. With the wealth of information from highlight to shadow areas, this mode is recommended when you are shooting a scene with post-shoot adjusting in mind. The Flat Picture Control was added with the Nikon D810 DSLR and can be found in cameras introduced after the D810. To adjust the Flat Picture Control on images, use Picture Control Utility 2 which can be found in Nikon Capture NX-D or Nikon ViewNX2 software programs (as of June 26, 2014) or Nikon ViewNX-i software (as of March 2015). The level of clarity can be adjusted in still photographs only. The lower the number, the softer the image. The higher the value, the clearer the image. While sharpening mainly controls the contours of a subject, clarity can control the subject’s clearness while maintaining the gradation of highlight and shadow areas. Clarity is useful when you want to make hazy-looking subjects look clear while maintaining the details, or when you want to make hard-looking subjects look softer and gentler. The strength of a subject’s contours can be precisely adjusted in increments from no sharpening (0) to sharpening (level 9). The lower the number, the softer the image will look. The higher the value, the sharper the image. Overall image brightness can be adjusted. When set to the minus side, contrast is provided to the highlight areas and medium tones are made darker. When set on the plus side, the scene can be brighter while overblown highlights are prevented. This is useful when exposure compensation may result in the washout of highlight areas. When set to the minus side, the image looks lighter and less vivid. When set on the plus side, the image appears deeper and more vivid. The level of hue (coloration), e.g. red, yellow, green, blue and purple, of images can be adjusted. For example, in terms of skin tones, the minus setting increases redness, while the plus setting increases yellowness. Provides an effect similar to shooting B&W photographs with a color filter. Y (yellow), O (orange) and R (red) are effective to emphasize the contrast, with contrast strengthening in the order Y to O to R. This is useful when you want to decrease the brightness of the sky to make the scene look deeper and denser. G (green) provides a similar effect to shooting B&W photographs with a green filter, making some areas of an image appear deeper and denser. This can make the skin tone or lips look subdued, which is effective for portrait photography. Enables you to control the toning level of the entire image as if toning B&W photographic paper. You have a choice of 10 colors including the default B&W. Each Picture Control (except Flat, Neutral and Monochrome) allows you to use Quick Adjust for adjustments. Quick Adjust makes it easy to achieve well-balanced adjustments. With sharpening, contrast, and saturation, five levels of modification (-2 to +5) are applied automatically. Increasing a value on the plus side strengthens the characteristics of each Picture Control while movement on the minus side lessens the effect. Moreover, after using Quick Adjust, you can carry out finer, more detailed modifications to each item to suit your particular preferences and get the exact results you require. Custom Picture Controls allow you to create your own image style and name them. You can use Picture Controls created with Picture Control Utility 2 which can be launched from within Nikon ViewNX 2 or Capture NX-D software, or use Picture Controls created on other cameras by importing them to the camera on a memory card and registering them as custom Picture Controls. You can save the settings of your personal adjustments as a Custom Picture Control in the camera so that you can use them again. For example, if you’ve made a special adjustment and you intend to use the same setting again in a similar situation, you can register the setting and save it in the camera, so that you can easily find it the next time it is needed. 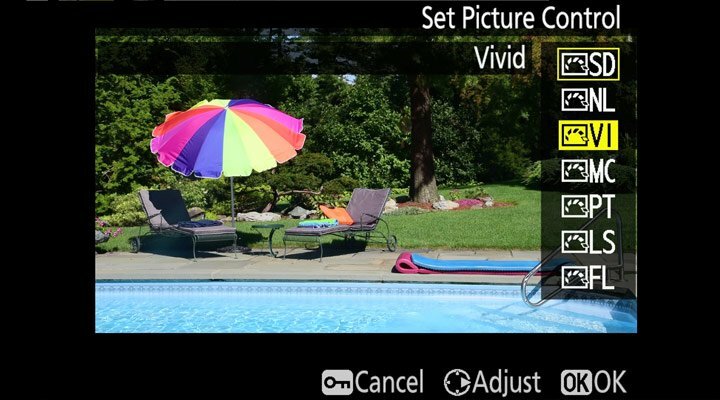 You can save up to nine custom Picture Controls in a DSLR camera compatible with Picture Control. Custom Picture Controls created with the D810 cannot be transferred to cameras released before the D810.